Carla Regler is one of Cornwall’s well known photographers, not just for her storm images of Porthleven but for running an extremely successful café/restaurant whilst turning a photographic hobby into a full-time career. We all bring disparate parts of ourselves into our photography and skills that we might initially dismiss as unrelated can prove invaluable. It was not only Carla’s photography that caught the eye of Charlie Waite but also the way that she looked after customers at the café/restaurant that she and her partner run in Porthleven. She now helps lead workshops for Light and Land and at the time of the interview had just returned from two week-long workshops in Iceland. Cornwall, Norway and Italy also feature in her diary. 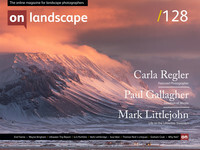 Carla’s aerial photographs of Iceland As The Delta Flows were featured in Issue 119 of On Landscape and encouraged us to divulge a little more about herself and her photography.